Heat oven to 350°F (if using dark or nonstick pans, heat oven to 325°F). Grease and flour two 9-inch round cake pans. In large bowl, beat all cake ingredients except chocolate chips with electric mixer on low speed 30 seconds. Beat 2 minutes on medium speed. Stir in chocolate chips. Pour batter into pans. Meanwhile, to remove seeds from raspberries, place strainer over small saucepan; pour raspberries into strainer. Press raspberries through strainer with back of spoon to remove seeds; discard seeds. Stir sugar and cornstarch into raspberries until smooth. Cook over low heat until mixture is bubbly and thickened, stirring constantly. Boil 1 minute. Place waxed paper or plastic wrap over surface of mixture; refrigerate 30 minutes or until cold. Fold in whipped cream. To assemble torte, place cake layer, top side down, on serving plate. Spread with thin layer of frosting. Top with raspberry cream, spreading to within 1/2 inch of edge. Frost sides of torte with remaining frosting. Refrigerate at least 1 hour before serving. 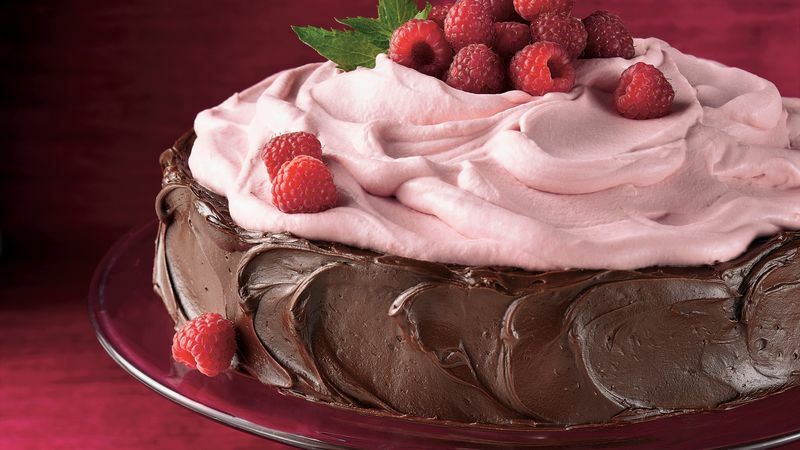 Just before serving, arrange raspberries around top edge of torte. If desired, garnish with additional fresh raspberries and mint sprigs. Store torte in refrigerator. If desired, prepare cake layers ahead of time and freeze. The torte can be assembled up to 6 hours before serving.